The best film of 2018 was also one of the queerest. “The Favourite” is centered on a lesbian love triangle with England’s Queen Anne at the apex. The acting is superb, the design is sumptuous, and the script is witty and literate. The tone is delightfully bawdy and irreverent, but director Yorgos Lanthimos has some serious things to say about history, war, politics, gender and the human heart. A pro tip: pay attention to the bunnies. They play a surprisingly important role in the unfolding story. “1985.” With deep compassion, Yen Tan tells the story of a closeted HIV-positive gay man who returns to Texas to spend Christmas with his conservative family during the early days of the AIDS crisis. The black and white cinematography is stunning and the richly nuanced performances are heart-breaking. “The Cakemaker.” When his Israeli lover Oren is suddenly killed in a car accident, grief-stricken German baker Tomas travels to Israel to learn more about the man and his family. Writer/director Ofir Raul Grazier expertly guides an excellent cast through a thoughtful film that questions the labels that shape our lives. “Can You Ever Forgive Me?” When her celebrity biographies go out of fashion, lesbian author Lee Israel turns to a career of literary larceny. Melissa McCarthy turns in a great performance as the grouchy writer and Richard Grant is terrific as her gay sidekick. “Colette.” Keira Knightley shines as the famous French author who bravely explores both her emerging literary voice and her bisexuality. In an important move, openly gay writer/director Wash Westmoreland features trans actors Jake Graf and Rebecca Root in cisgender roles. “Crazy Rich Asians.” This delicious rom-com is about the clash of cultures between New Yorker Rachel Chu (Constance Wu) and the hyper-rich family of her Chinese fiancé Nick Young (Henry Golding). The costumes are gorgeous, the scenery is stunning and the top-notch cast includes out actor Nico Santos as gay cousin Oliver. “The Death of Stalin.” Writer/director Armando Iannucci (HBO’s “Vice”) turns his focus from contemporary Washington to Cold War-era Moscow in this biting satire about the pomp, pageantry and power plays following the death of the Soviet dictator. With caustic wit, Iannucci examines the humanity of his characters and the absurdity of their behavior with both passion and precision. “Disobedience.” After writing and directing the Academy Award-winning “A Fantastic Woman,” Sebastián Lelio turned to a tale of forbidden lesbian love in an Orthodox Jewish community in London. Rachel Weisz, Rachel McAdams and Alessandro Nivola turn in riveting performances as childhood friends whose adult lives are torn apart by illicit passion. “Stan and Ollie.” Although most DC audiences won’t be able to see this fine film until January, this outstanding movie was released just in time for awards consideration. 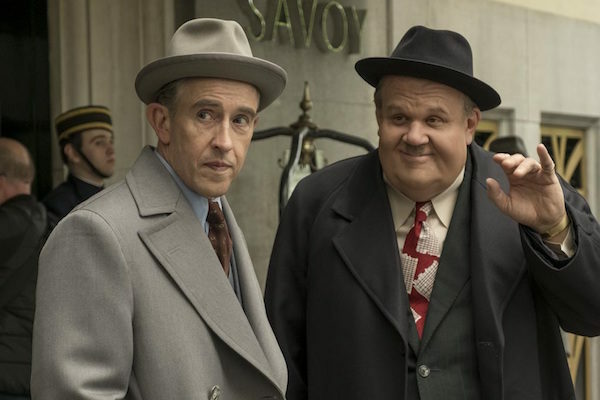 Well past their prime, the famous comedy duo of Stan Laurel (Steve Coogan) and Oliver Hardy (John C. Reilly) embark on a grueling tour of post-war England and environs while they wait for their Robin Hood movie to be greenlighted. The movie is a pitch-perfect portrait of two aging comedians and their exasperated but devoted wives (great performances by Nina Arianda and Shirley Henderson. There were also some movies that deserved to be labeled “The Worst” of 2018, not because they were train wrecks (like “The Happytime Murders”) but because they contained material that demeaned women and the LGBT community. Out director Luca Guadagnino directed one of the best films of 2015 (“A Bigger Splash”), as well as last year’s “Call Me By Your Name.” This year he finally released “Suspiria,” a passion projectthat he described as an homage to the 1977 Dario Argento film of the same name. Unfortunately, his remake did not rise above the level of pretentious art house fare and was filled with meaningless allusions to the Holocaust and the Berlin Wall and numerous scenes of bloody, graphic and gratuitous violence against women. Written and directed by Dan Fogelman (creator of TV’s “This Is Us”), “Life Itself” started with a pointless homophobic joke and went down from there, wasting a wonderful cast on a leaden script laden with platitude and coincidence. Despite good intentions, a promising scenario and fine performances, “Green Book” is the latest version of Hollywood’s “Great White Savior” movie (think “Mississippi Burning” and “The Blind Side”). Echoing “Driving Miss Daisy,” straight white man Tony Lipp (Viggo Mortenson) becomes the “Straight White Savior” as he teaches gay black pianist Don Shirley (Mahershala Ali) how to be a man and how to be a black (by eating fried chicken, of course).